STOLEN BETWEEN 5:30AM AND 10:30AM ALONG WITH MY ROOMMATES 1978 YAMAHA ENDURO. PLEASE CALL/E-MAIL WITH ANY INFORMATION. 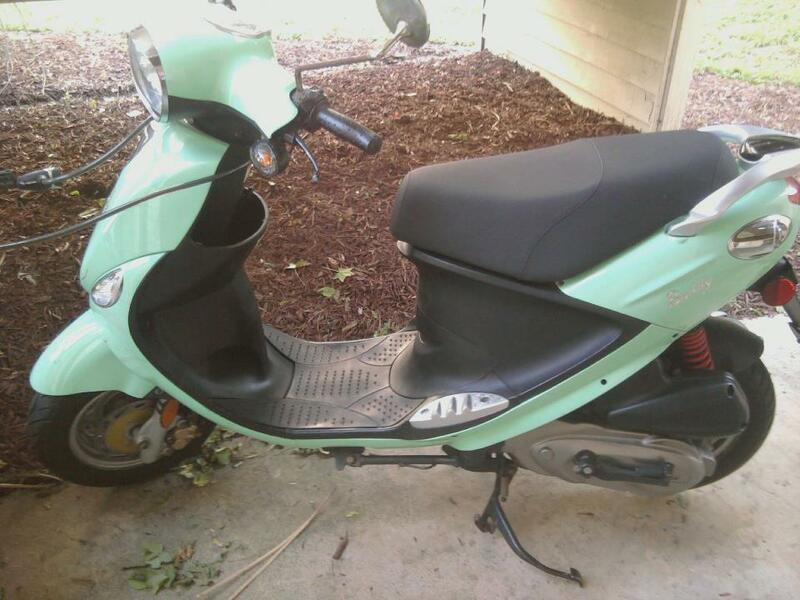 This was stolen on May 29th, 2012 between 5am and 7am from the parking lot of Mill Creek apartments near UNC Wilmington. 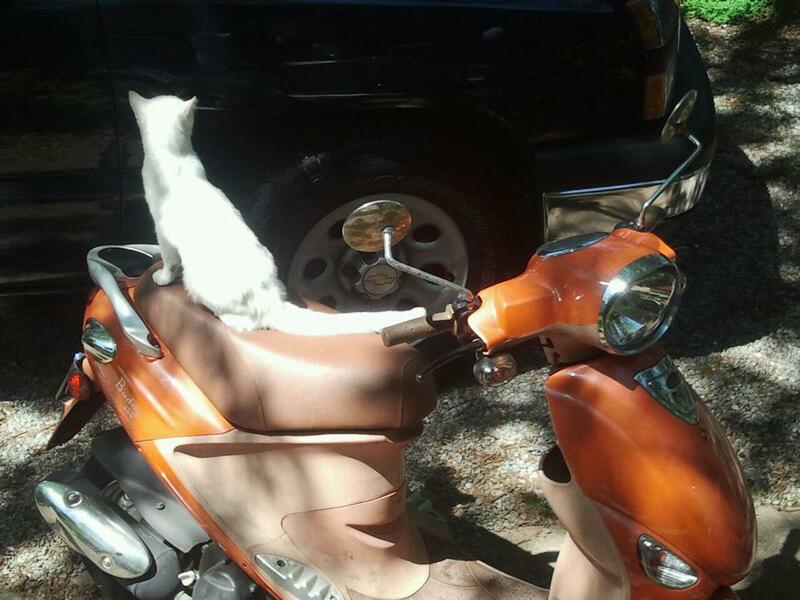 Stolen in the East Ridge area near Missionary Ridge off John Ross. I can supply additional info if you call. 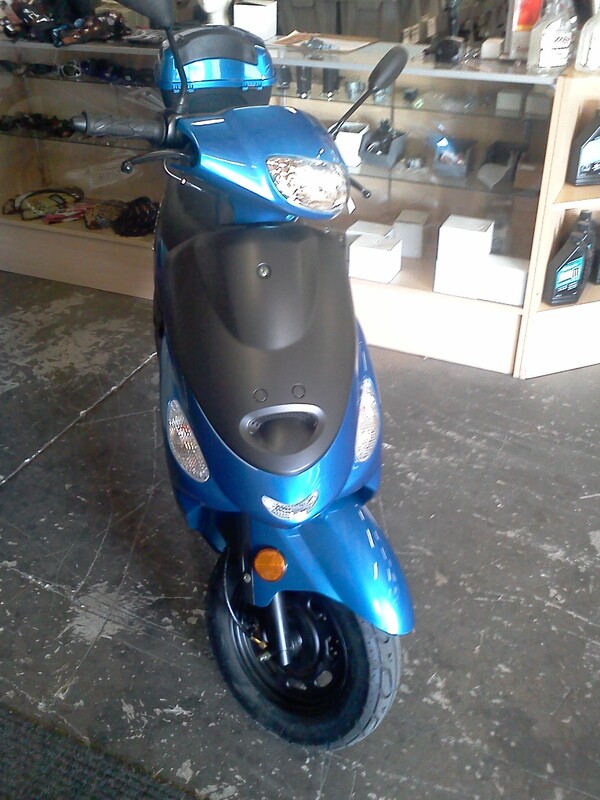 Black yamaha zuma with windshield, big scuff on left rear panel and smaller scuff on front. Larger red decals removed. 1900 miles on odometer. 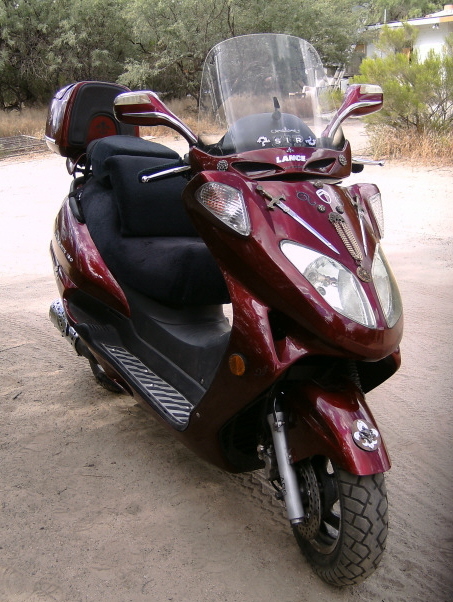 Black yamaha zuma with windshield, big scuff on left rear panel and smaller scuff on front. Larger red decals removed. Stickers on various parts, UNI, Clean air. 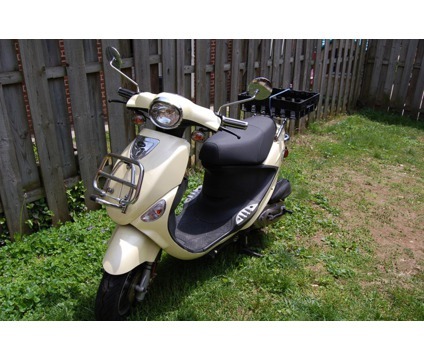 The scooter was stolen from my driveway at 1:10am on May 17th. The thief was a young black male wearing a white back pack. 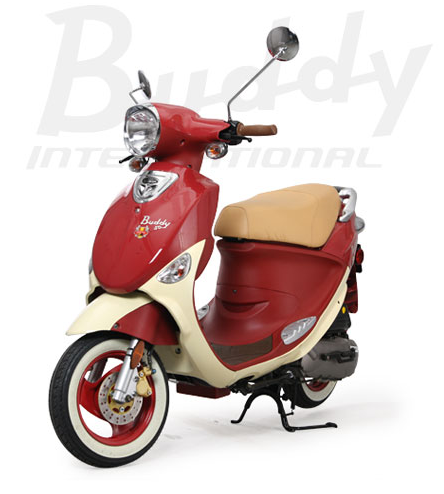 The scooter was stolen between 2:05 and 2:15 pm off Oxford St. The scooter was missing it right rear view mirror which had broken off. Has white paint teardrop shape on right rear fender covering scratch. Blue sticker left fender, also covering scratch if it has been removed. The scooter was pushed out of my yard by some kids who gave up on the theft and left it on the street. Some neighborhood kids said they then saw a pick up truck come by and take it. 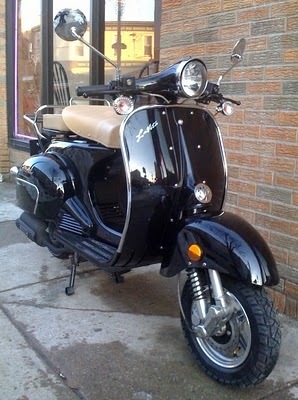 My poor scoot was stolen from in front of my house overnight, between midnight and 9:30am. She has a crack on the left of her headlight casing. PLEASE call me if you find anything!!! I was gone for the weekend from my apartment from Friday night of May 4, 2012 to Monday morning of May 7, 2012. 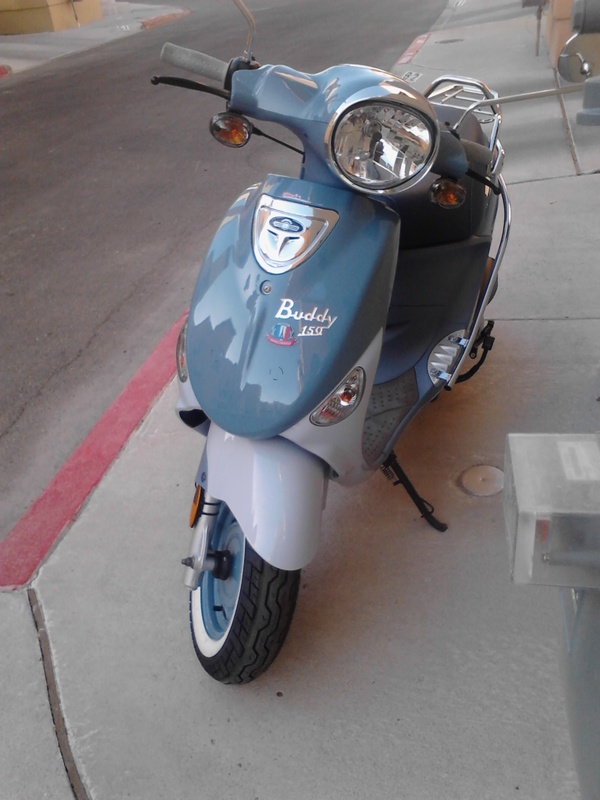 I believe the scooter was taken by truck since I am almost positive that the steering column was locked. There should be an old parking sticker behind the seat and the left rear blinker is falling off. In addition, a rear reflector is missing as well. There are a lot of scratches by the keyhole of the starter and the trunk. 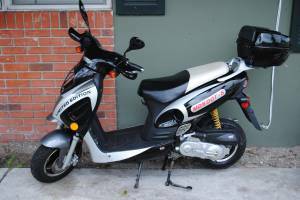 In addition, the electric starter does not work. Lastly, the kickstand and the battery was recently replaced. Parked at work in the orange deck of the Williams tower at the Galleria. At the corner of 8th and Montrose in the Italian Market area of Philadelphia, I witnessed thieves pick up a scooter and throw it into the back of their pick-up. I tried to block them from moving with my own truck but they were able to back down the street and drive away. 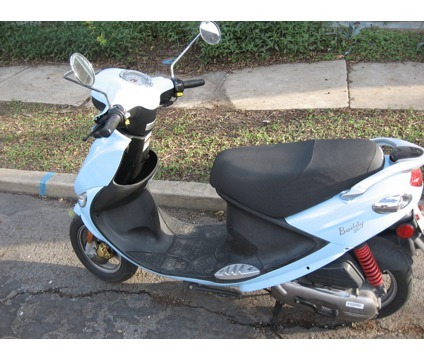 The scooter they stole was the blue delivery scoot for a small mexican restaurant at 8th and Christian. The thieves had NJ tags, YHS 94Z Two black guys, one with short dreads. Dark green early 90s small pick-up, with a black tubular ladder rack. Police were called while theft was in process. Report was filed. Be careful out there. If it isn't bolted to the ground, they'll take it. 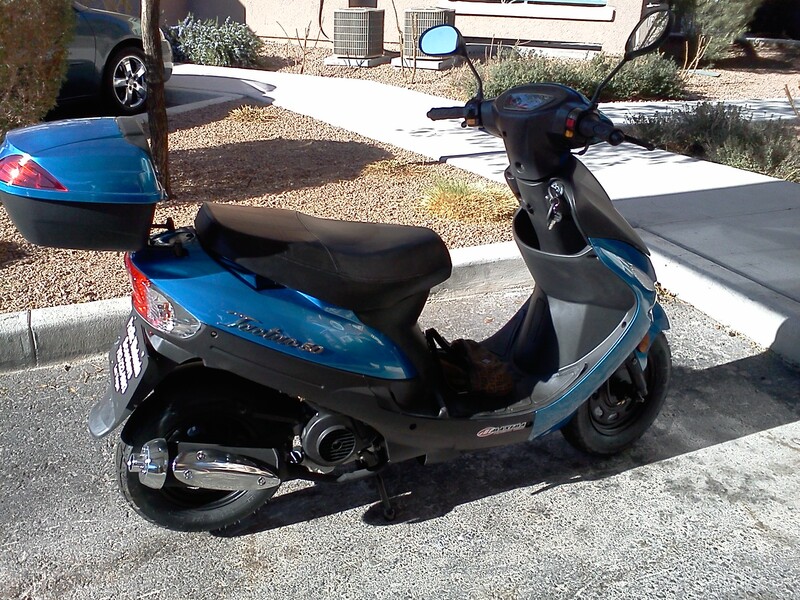 Stolen in Broad daylight between 12:00 pm and 4:00 pm at Roosevelt and Nezperce, from the parking lot of the Hillcrest View Apts. It was parked underneath the bridge at Bunker Hill Community College, going to the Student Parking Area (where all the scooters/motorcycles are always parked). It must have been stolen between 5:30PM and 9:45PM. Crack on the muffler casing and a purple dinosaur sticker below the dashboard. 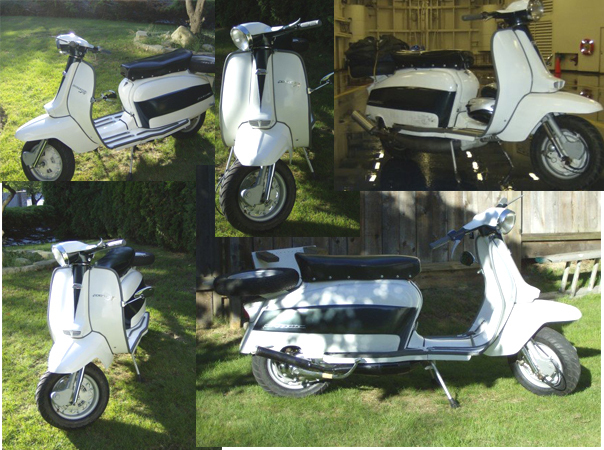 Stolen at approx 7;30pm outside of Safeway in Canton. Has black plastic rack on the back. Natty Boh and Barack Obama Stickers on right rear fender and I Love Patterson Park sticker on rear left fender. 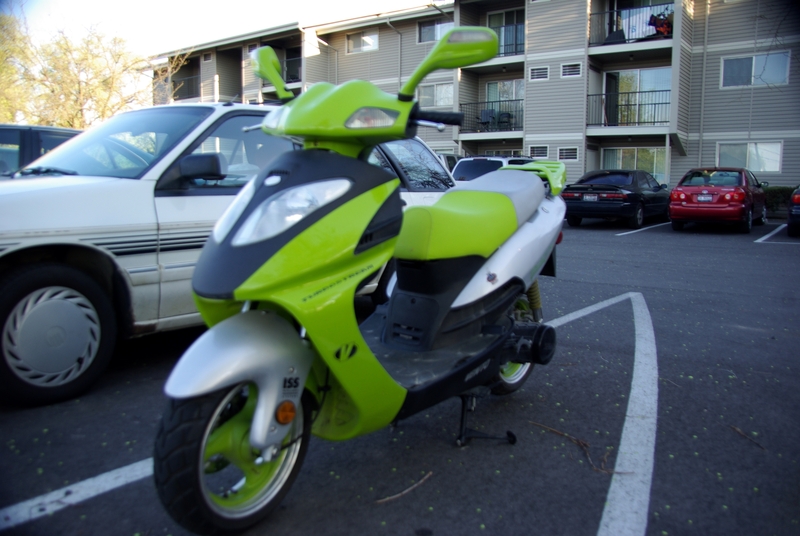 The front of the scooter has three bolts in the shape of a triangle where the front rack used to be. SORRY FOR THE RE-POST! DID NOT PUT DOWN MY EMAIL ADDRESS. 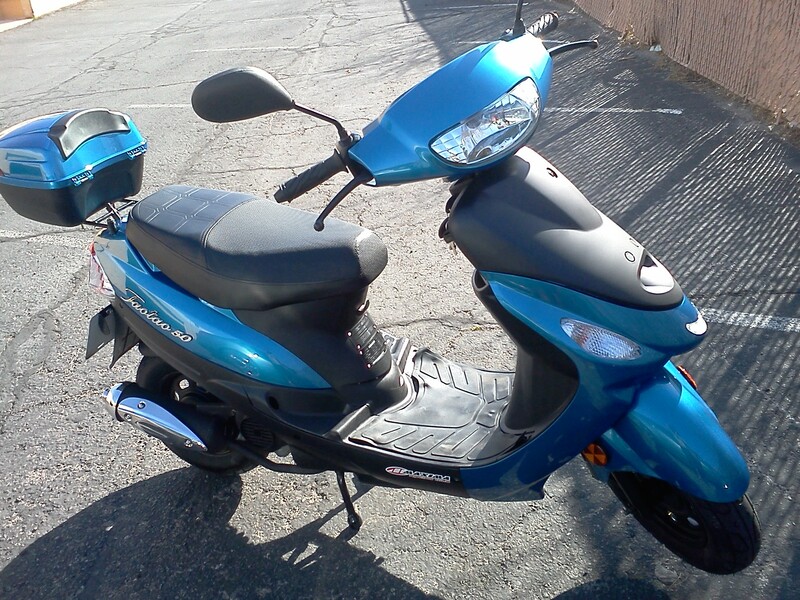 Stolen at approx 7;30pm outside of Safeway in Canton. Has black plastic rack on the back. Natty Boh and Barack Obama Stickers on right rear fender and I Love Patterson Park sticker on rear left fender. 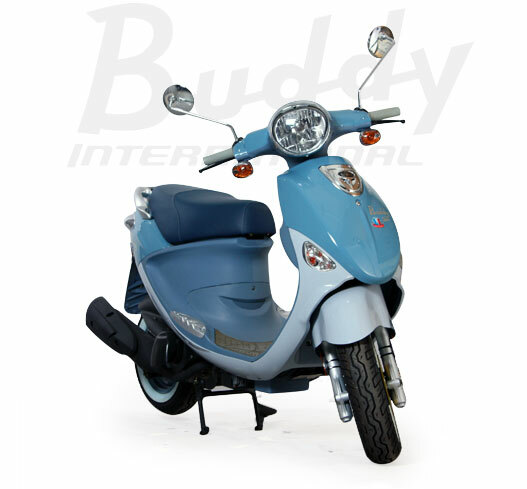 The front of the scooter has three bolts in the shape of a triangle where the front rack used to be. 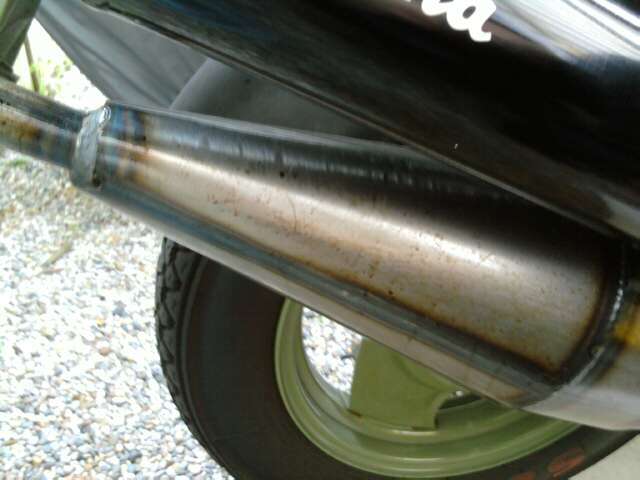 SCRATCHES ON THE RIGHT SIDE ON THE EXHAUST. HEADLIGHTS HAVE EYEBALL DRAWINGS ON THEM. 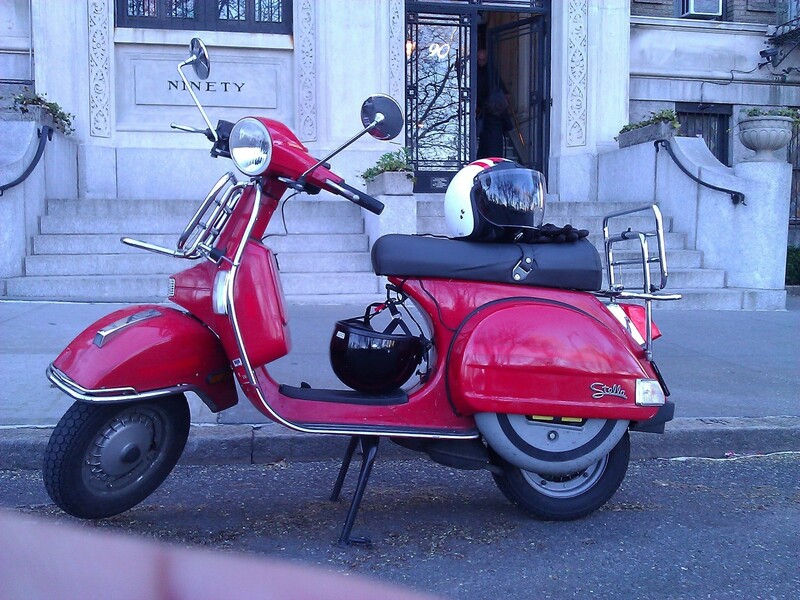 AROUND 8215 MILES WHEN STOLEN. 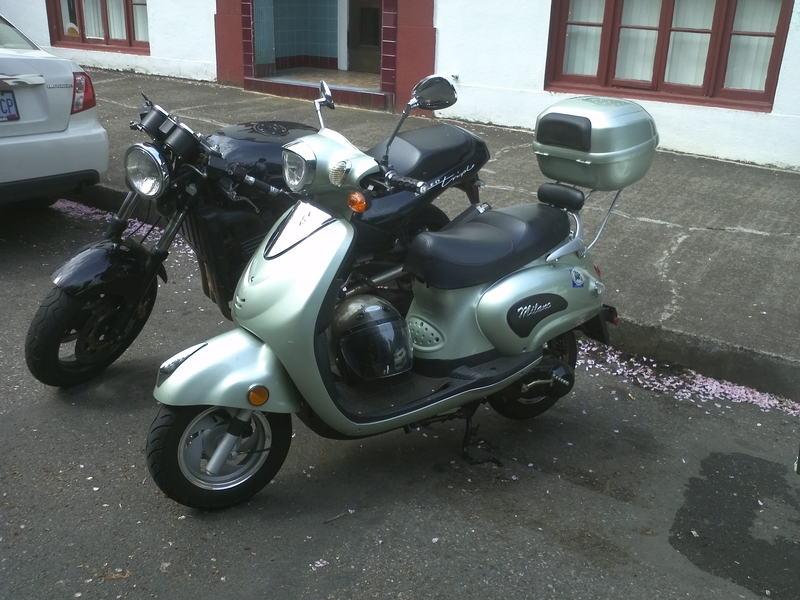 It was stolen right in front of my apartment building at 4816 30th avenue. 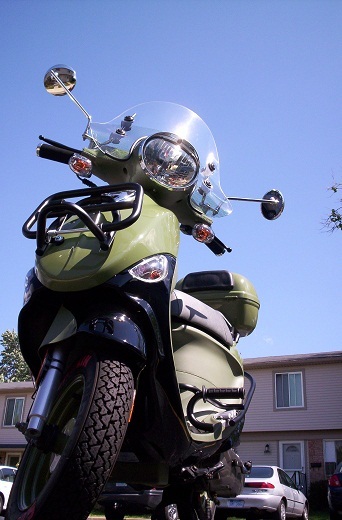 The scooter has bungee cords holding up the front end and a huge crack in the front end. It is very obvious. I just got it from a friend and was going to register it. Just moved to this neighborhood. Most likely Mexicans. They steal bikes in this neighborhood all the time. It had no plates on it. Has reflective tape on cowls. Front and rear chrome racks. 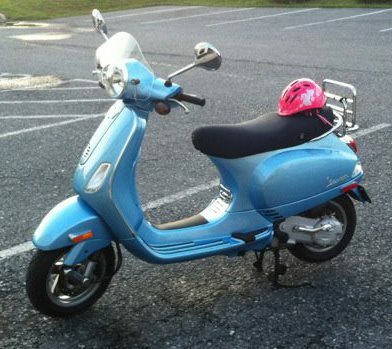 Stolen from the Eastover Ridge Apartment Complex. I am told that on the same night mine was stolen 2 others were also stolen from the site. Stolen in the evening from in front of the house. Column was locked in the left turn position. Taken from my driveway. Steering was locked. 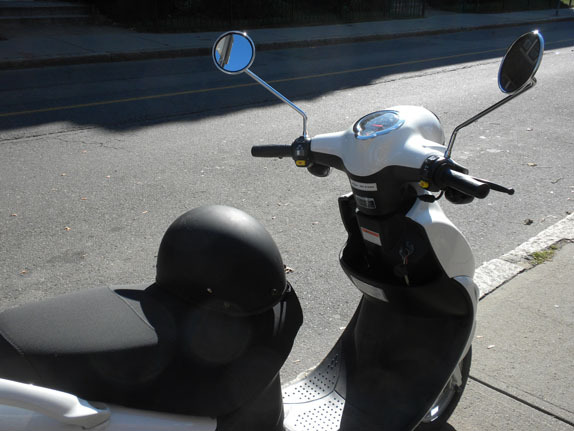 There are scratches down the right side of the scoot, including the back of the right mirror. 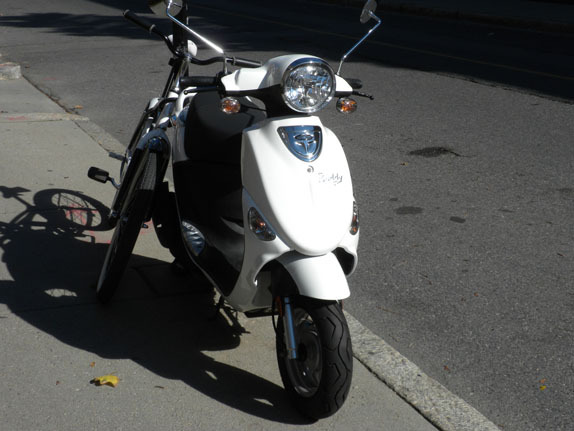 Picture is not my scooter, just similar. Stolen out of my backyard. They don't have original keys. 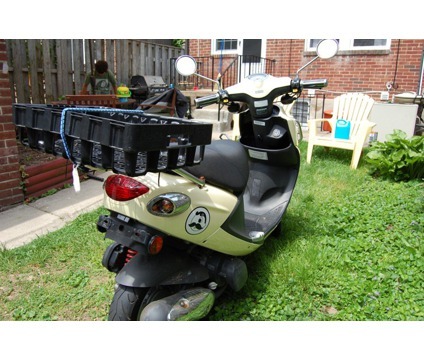 Givi box with no keys on back. Has cupholder perm mounted on coloumn. 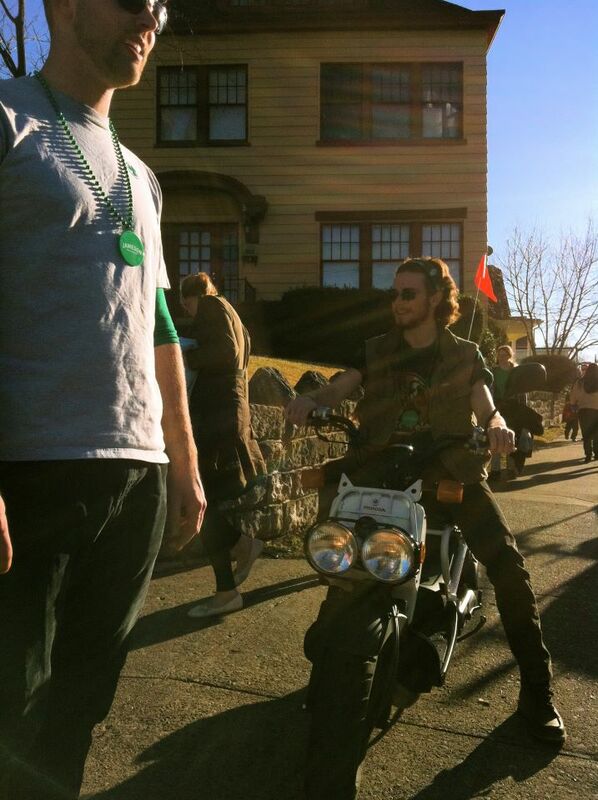 Fairly stock scoot.Has been reported to Denver PD. 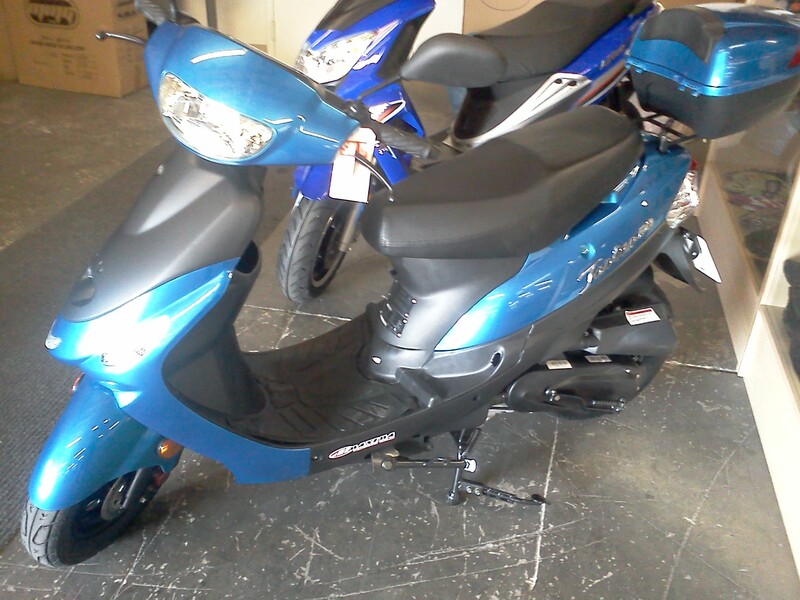 It was stolen in Marsh parking lot off McGalliard Road. they caught the thief, Frankie Lee Johnson, 19 from Muncie. He was charged for taking mine and 3 others. They recovered all but mine. There was a video tape and pics of him taking it. Left front tire behind, 2 knife marks through seat. 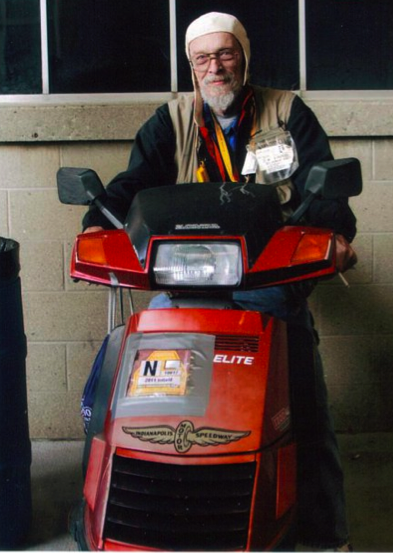 My third scooter stolen from outside my busy center city building. Two locks, chains and an alarm system...what more can I do? Moving to the suburbs, disgusted with humanity. 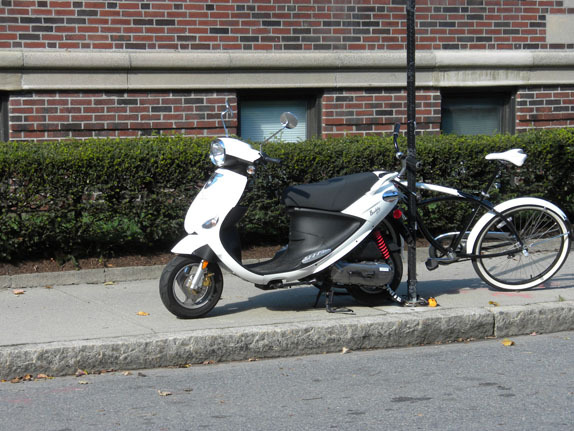 Scooter was stolen from University Townhouses. 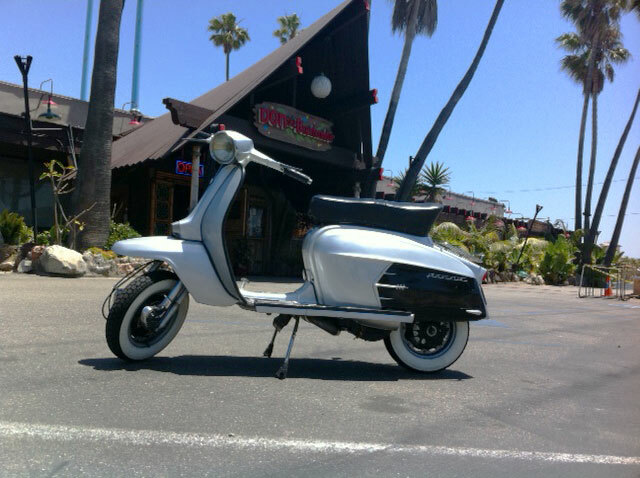 Scooter had a stage 1 performance kit installed as well as dr pulley sliders, a black front and rear rack and cowl protectors. The original in body turn signals have been converted to LED dead lights. It's got quite a bit of customization so it will be hard to miss. Stolen from Wash Park area of Denver. Ignition was in the lock position so they would need to get a key made or rigg the ignition. 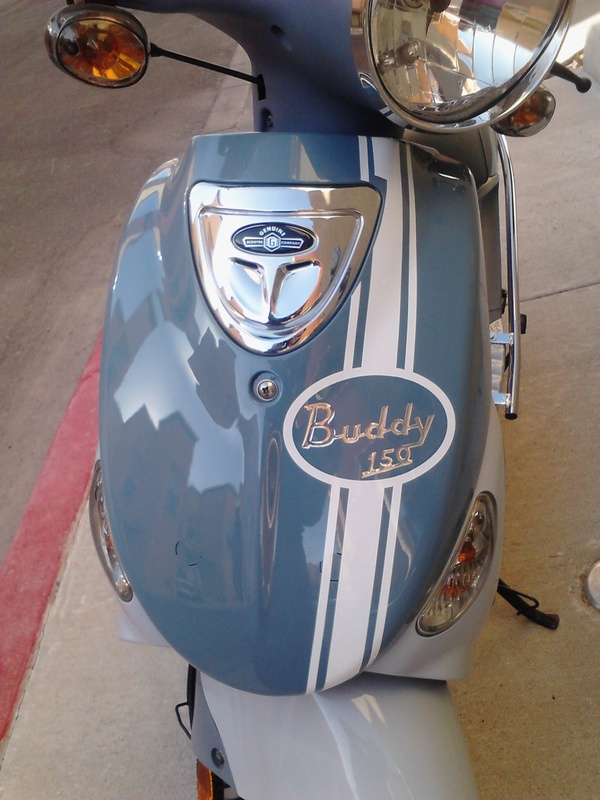 Scooter has 1600 miles on it at time it was stolen. 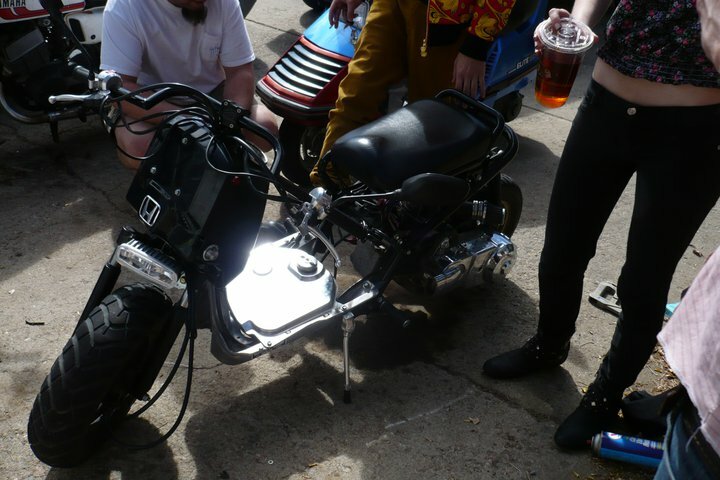 Honda Ruckus w a Gy6 Swap 125 cc engine, entirely custom. Black w chrome accents. 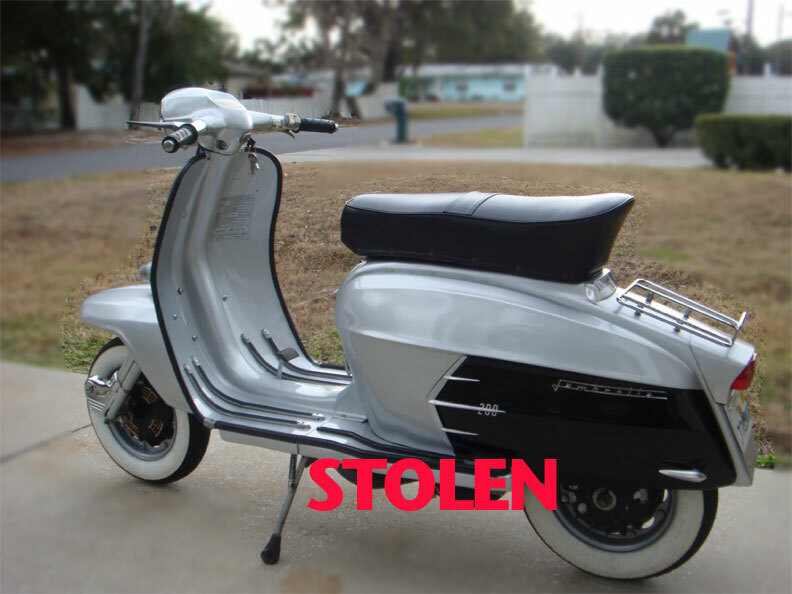 My lambretta was stolen in the trunk of a 2001 Hyundai Sonata either white or silver. My bike has slight damage and paint chips to the right of the ignition slot on the headset it also has a Mikuni 28 flat side carb as well as a electronic ignition so no battery. I had just finished rebuilding the engine, but the head shroud was in need of being replaced so the bike will be quite noisy. A curse on that bike and whomever has it now. REWARD FOR IT'S RETURN.